Can't think of what to get for that special someone? Give them a gift card from SunnyPatch Boutique! 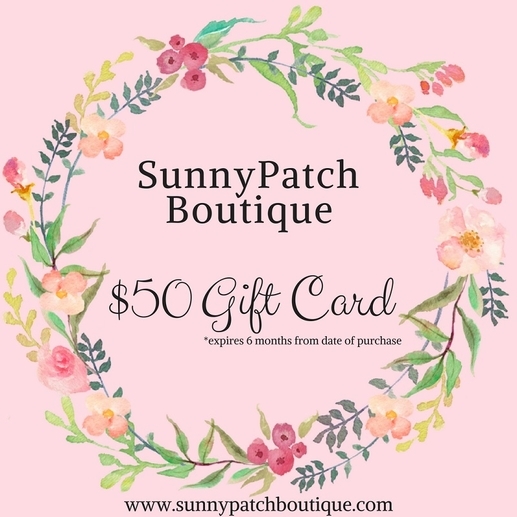 Each gift card is good for 6 months from the date of purchase and will be emailed to the recipient. PLEASE WATCH YOUR EMAIL. A UNIQUE CODE WILL BE EMAILED TO THE EMAIL ATTACHED ON THE ORDER. Please use code LOCALPICKUP at checkout to clear all shipping fees off and check your email for the UNIQUE code to be emailed!